While waiting in line at the Rooftop Coffee Bar at the San Francisco Museum of Modern Art earlier this week, I couldn't help but overhear a young lady nearby ranting about -- of all things -- how pretentious Stumptown Coffee is. She was talking to a somewhat older gentleman -- her father? her art professor? -- and seemed particularly offended that Stumptown's cafes serve French-pressed coffee instead of drip coffee. "Of course," she added with disgust, "Stumptown is from the most pretentious city I've ever been in: Portland." Interesting. She's enjoying a visit to a museum that currently exhibits not just one rectangular painting of a uniform gray but also a second such work, yet she thinks coffee presses are pretentious. Not to mention the fact that the Blue Bottle cafe we were standing in serves an espresso drink designed by kitsch-meister Jeff Koons, whose porcelain Michael Jackson is also on display at SFMOMA. I mean no disrespect to the museum or the art world, but isn't irony delicious? 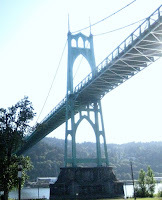 As I stood there pretentiously sporting my Hawthorne Bridge T-shirt, I turned to ask the Stumptown hater, "Portland is more pretentious than San Francisco?". "Well," she replied, "it certainly has a higher ratio of pretentious to non-pretentious people." Oh well, Portland will always have its detractors. In fact, the girl at the art museum reminded me in a way of cranky Portland beer blogger Dr. Wort, though instead of finding us too pretentious, he thinks things are too sloppy here, and he pines for the more refined San Francisco beer scene he experienced as a lucky denizen of the Bay Area. Though conceding that SF has a relatively small number of breweries and brewpubs, the Doc fondly remembers them as places where -- this is a quote -- "the gastronomic delights abound". It's tempting to pick apart the doctor's fawning over some California places that he would excoriate for their blandness if they magically appeared here in Portland, but I think I better get on with my own report of this week's trip to San Francisco. It was a family vacation, so there weren't any late nights or beer-soaked days, but Carla and I made it out to a few beer places. Sunday evening we swooped down on our San Fran man Andy, who hiked us from his apartment to Zeitgeist and then Toronado, neither of which I had been to before. Toronado was smashing -- an interesting, well-rounded selection of draft beers, reasonably priced. It's got a little bit of a dive bar feel to it, in the sense that you could sit there in the dark and be perfectly at ease. The place is famed for bartenders with attitude, but I thought the service was good, and they even forgave me a faux pas when I accidentally slammed my empty glass down on the zinc bar with a loud bang. The delicious cheap sausages from Rosamunde's next door were the icing on the cake. Kind of ridiculous I'd never been to Toronado; now I'll make sure and get there every time I'm in the city. On the other hand, Zeitgeist was a disappointment. In his recent report on San Francisco, Ezra said Zeitgeist has about 40 taps, but Sunday at least 25 of those were blown -- the Sierra Nevada Imperial Stout blew with my order. My wife only gets IPAs anymore, and there wasn't a single IPA or even Pale Ale left when we were there. She ended up with a so-so amber called Poppy Jasper from El Toro. The Zeitgeist beer garden is set up pretty nicely, but it was way too crowded. We found a vacant place to sit, but had to wait awhile for the empties from the previous occupants to be bussed, and forget about a rag to wipe the table. Of the 500 people in the yard, 350 were smoking cigarettes and another 25 were openly smoking pot. I've got no particular beef with those activities, but it wasn't our scene. On other nights we made it out to 21st Amendment and the Thirsty Bear, both walkable from our Market Street hotel. It had been a few years since I'd been to 21A, so I was glad to get the chance, but the taplist was a little disappointing -- IPA, Amber, Red, Light Golden, Watermelon Wheat... ho hum. The Smoked Imperial Porter was the standout, though it bore a cruel California price tag of $7 for 10 ounces, plus tax. Of course Carla went with the IPA, and it was very tasty -- the hop aroma would remind you of orange blossoms or apricots. The food we tried was quite decent, if a little spendy for what it was -- a brick-oven pizza and a loaded cheeseburger (no tater tots). We didn't try any entrees at the Thirsty Bear, but the oysters with avocado granita and sea salt were brilliant. I enjoyed the abbey-style Belgian ales (one golden, one "amber") that were on as seasonals, although we found the cask IPA to be a little humdrum. It's an odd place -- they get a lot more business from the convention center nearby than from any kind of regular local crowd. It's worth a visit if you're in the area. I realize that this post meandered around quite a bit, and might not have all that much to do with the headline. For me the main beer lessons of this trip were: first, Toronado goes a long way toward redeeming the sparsity of San Francisco's beer scene; second, be it ever so pretentious, there's no place like home. Labels: california, coffee, food, pub crawls, pubs, rants, san francisco, vs.
Wow, she sounded pretty sure of herself re: PDX vs. SFO... Did you ask to see her data? What an idiotic thing to say out loud. As for Zeitgeist's inadequacy, do you know if there was an upcoming festival or something? Late last week, at Brouwer's here in Seattle, there were only maybe 15-20 beers or so on 60+ lines. They were getting ready to hook up all of the barley wines for the Hard Liver fest. Perhaps that explains it? I just hope the Doctor doesn't cut and paste 18 entire gastropub menus here as a rebuttal. I haven't had to delete a comment in a long time. But seriously, click over to the link I put to Doc Wort's SF entry. "Gordon Biersch has a HUGE Menu that covers everything from Pasta to steaks to sandwiches to seafood." If I wrote that about Rock Bottom he'd blow a gasket. Next time, head East! The Trappist, Luka's Taproom and Pacific Coast Brewing in Oakland are all worth a stop. Same for Jupiter and Triple Rock in Berkeley. I hear good things about Cato's, but unfortunately I've never been. @beer hiker: I don't think Zeitgeist had a festival coming up Monday, I think they just got slammed on a beautiful Sunday afternoon. Still, even though Ezra says it's the one bar he would pick if he could only have one, he admits the taplist there isn't "super carefully chosen". That many empty taps, no matter what the reason behind them, seems ridiculous. If it was festival related, that really makes me appreciate things like lucky lab barley wine and big beer fest, portland cheers to belgian beers, or when hopworks hosted the oregon bounty fresh hop fest: Keep the taps at the bar going, and set up another section with additional taps for the fest. Who's equipment is all that anyway? On a side note, I have a couple of friends that moved to Portland from San Francisco, and their favorite past time is to talk about how much better everything is there. Yet they haven't moved back. Let them hate on Portland. The longer they don't know about how awesome we are, the more the awesome will last. I was going to address Dr. Worts hypocrisy on sf vs. portland myself in the sf post but it ran on too long already. I agree with Bill, SF has many charms but overall Portland wins hand down. SF beer bars are either fancy, expensive with fine food or divey with no food. And I have no problem with either of those things but you cant beat the massive variety in portland and the ability to find good beer and atleast decent food no matter where you are. Regarding Zeitgeist, as you put it I think its probably just not your seen. I dont know what to say about the taps they usually have more going but the casual party atmosphere and the fact that people might be smoking pot as if your actually in someones backyard house party is a lot of the charm for me. Now if you could combine the atmosphere of Zeitgeist with the beers of Toronado that would be the ultimate....oh wait, that is what APEX is doing in Portland. Wonder what doc will say about that place when it opens. P.S. you never made it to Magnolia? @Samurai: Walked past Magnolia, but had the kids along and no one was up for it. I've been there in the past, I'll have to go again sometime. @irving: Yep, I am totally an SF beer beginner. I'll try and scratch deeper next time, maybe even head across the bay like Beau suggested. Thanks for the reference Bill! This is great DW bait! Even when I lived in the Bay Area, I didn't bring my family for a cross section of the beer landscape. You should have gone to Six Flags or Great America with the kids! Take them on a Cable Car or a walk through Fisherman's Wharf. That's were all the tourists with families go! Did you bring the kids to Zeitgeist without a Tetanus shot! "the gastronomic delights abound" is a true statement if you actually know what GASTRONOMIC means. Since you are questioning the lack of tater tots, I would guess not. "Gordon Biersch has a HUGE Menu that covers everything from Pasta to steaks to sandwiches to seafood." If I wrote that about Rock Bottom he'd blow a gasket." Thanks for reading and yes, it was a stretch writing that comment. I'm not a huge fan of GB. Corporate crap food and beer, is corporate crap. I think you'd find a more diverse menu at GB and even some Lagers... you know, the other entire catalog of beer that's missing from Portland. Don't bring up Heater-Allen, you'd be wasting your time. I agree with your Zeitgeist rating. It's a biker bar that now appeals to Hipsters. Need I say more? That said, you could have checked out "Broken Record," "Lucky 13," or a dozen other and found a thriving Hipster scene that has a decent beer scene and/or adult pub food. Sorry no tater tots! Although your kids may have loved them, as I did when I was a juvenile in elementary school with juvenile tastes. I could list all your misfires but I'm not going to waste my time. It's a city that obviously out of your league and you weren't prepared to seek the true treasures. SF doesn't have the Brewpub scene that Portland has, but it does have a diverse taste that is lacking here. Diversity in beer and food. I notice you didn't stray away from your NW comfort level... basic trendy ales and IPA's. That says volumes. "SF beer bars are either fancy, expensive with fine food or divey with no food." Yes! Class with great food. Wanna drink, go to a bar. Want tater tots, go to Portland the last bastion of juvenile drunken gastronomes. It's not Oregon it's an adult dose of reality. Wanna a great variety of beer? You tried Toronado, but there are many more. They may not brew it all there, but at least they offer the variety for the world to experience without the "Oregon Bubble of Reality" or fixation of the singular hop factor. Want a list of places you should have gone? Maybe you should have emailed me instead of ridiculing a International respected city. Is this the DW response you wanted? I probably will email you next time I'm headed that way. Even though I made fun of your Gordon Biersch recommendation, I have to admit that I wish I had consulted your guide while I was there, especially for the North Beach places you listed. We were kind of at loose ends over there one day, now I'm kicking myself that we didn't go to La Trappe or at least Kennedy's. By the way, I wasn't ridiculing SF. It's a great place to visit, but I'm happy living the pretentious tater tot lifestyle here in Portland. BTW... Feel free to come back to San Francisco anytime. They'll gladly take your money and send ya back to the sticks with some good souvenirs. Grab a copy of the most recent NW Brewing News. The cover article is on Bay Area beer bars. Any review of the SF beer scene has to include City Beer Store and Toronado. As for having a problem with people smoking pot openly in San Francisco, you came to San Francisco. Were you upset that the Golden gate still separated the Bay from the Pacific? Mario: I sure wish I had gone to City Beer Store. I will next time. Thanks for the tip! But based on your comment, I think you didn't read my article very closely. I did mention Toronado -- in fact I said it was "smashing". And I didn't say I have "a problem with people smoking pot openly in San Francisco"; I said "I have no particular beef" with that. Regarding the NW Brewing News article on Bay Area beer bars, this post explains why that article was useless to me. Nice take on beer here in SF. Having the family along does put a dent in things. Are tater tots the state food? I loves me some tots! For you next visit a great resource is www.beerbybart.com. It gives many public transit options for SF and the East Bay. By taking the SF/Bay Point BART line you can hit Beer Revolution (new shop downtown Oakland, patterned after City Beer), The Trappist, Pacific Coast, Lukas, Ben & Nicks & Barclays. Taking the Richmond line will get you to Jupiter & Triple Rock. Glad you enjoyed your stay, hurry back!